It is a pleasure to be here, to have this opportunity to speak to you all today. Particularly so given the occasion: the 20th anniversary of the Asian Investment Conference. Twenty years makes its own statement: of longevity, certainly. More important, of continuing relevance; indeed, international impact and influence, judging by the speaker list this year, as in the past years. Judging, too, by all of you here today. Here to get a keener sense as to which way the Eastern wind is blowing. As for this session, judging by the title of my address, you are here to get a handle on the Hong Kong economy, today and down the long and winding road. Well, I have only been on the job a little over two months. And, to be honest, I have never been a marvel at reading tea leaves, Chinese or otherwise. That said, we are busy creating our future here in Hong Kong. Over the next several minutes, I would like to share with you what we are doing, and what we are planning to do, to get where we want to be. To some extent, of course, the future of Hong Kong - a small, export-oriented economy - is shaped by the world around us: the global economy, our business partners and our prospective partners. There were moments, last year, when it seemed the sky might splinter if not fall. Today, with the first quarter all but done, I must say it is looking just fine, thanks. Indeed, it's looking very spring-like: full of promise and possibilities. Starting with the US economy. As US Federal Reserve head Janet Yellen said, earlier this month, following the announcement of the Fed's second rate hike in the last three months, "The simple message is the economy is doing well." To that, I can only add: please continue doing well. The European Union is also moving, if moderately, in the right direction, while the Mainland economy continues to grow. Trade flow in Asia overall has picked up. I am not suggesting a year of crystal-blue skies, not with all the momentum-draining variables out there. Known or unknown. In the US, faster-than-expected interest-rate hikes could deepen policy divergence among major central banks, shifting capital flows and sparking renewed global financial market volatility. It could also have a negative impact on asset prices here in Hong Kong. And more than tea leaves may be required to work out the new US administration's overall policy direction, with its seeming embrace of protectionism - a concern for global financial markets as well as trade. Brexit negotiations ahead may create broader turbulence, and general elections in France and other major European economies have the impact to ratchet up the risks to our global economy - and, of course, to Hong Kong. The good news is that our economy in 2016 got stronger the further we moved through the year, growing by some 3 (3.1) per cent, year-on-year, in the fourth quarter, thanks largely to improving exports and resilient domestic demand. This year, our external trade should benefit from a more benign global economic environment. The Trade Development Council's Export Index rebounded from 34 (33.7) in the fourth quarter last year to 47 (47.1) through the first quarter this year. Our export confidence was up for all our major markets. Separately, the improvement in visitor arrivals in recent months could well boost our services exports and retail sales. I am hopeful, too, that domestic demand will hold up, boosted by a variety of variables, from full employment and favourable income conditions to intensive building and construction activity. And I am confident that the fiscal package delivered in my February Budget Speech will stimulate the economy. Taking that, and more, into consideration, I believe that the Hong Kong economy will grow 2 to 3 per cent in 2017. Up modestly from last year's 1.9 per cent. As for inflation, it's expected to ease further, from 2.3 per cent last year to 2 per cent in 2017. The long-term promise of Hong Kong begins with our location - at the heart of Asia. The economic centre of gravity has long been shifting to Asia, and the pace of that movement has accelerated since the 2008 Global Financial Crisis. Asia, today, is the engine of global growth. The Mainland continues to lead the way, even as its shifts from investment- and manufacturing-led growth to a greater focus on services and consumption. Hong Kong's deepening economic integration with the Mainland and our ties to other Asian economies have served us well. Indeed, we have benefitted hugely from the region's enviable growth and sustained wealth accumulation. 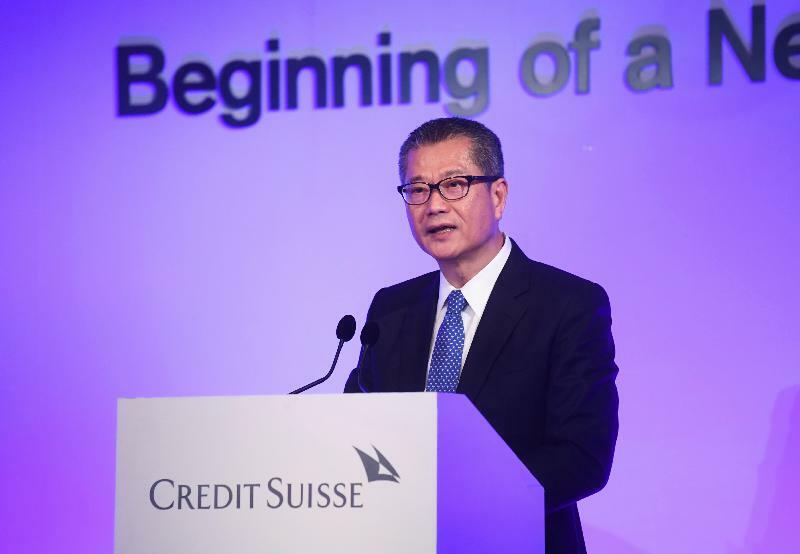 As has, I might add, Credit Suisse in its strategic focus on the Asia-Pacific region. Moving to the future tense, Hong Kong will continue to benefit from our deep regional and strategic ties. Getting to the meat of the matter - 2016 was another good year for Hong Kong's equity market. For the second year in a row, we ranked first, globally, in funds raised through initial public offerings (IPOs). Indeed, we have been among the world's top five IPO fundraising centres for the past 15 years. As of January, our market capitalisation exceeded HK$26 trillion. Such achievements would not have been possible without our resourceful, ever-adaptable industry. And this Government is committed to doing all it can to perpetuate success at a world-beating level. That's why, in my February Budget Speech, I pledged to further develop our listing platform. Why Hong Kong Exchanges and Clearing (HKEX) is now looking at ways to enhance our listing competitiveness. Together with the Securities and Futures Commission, our securities regulator, HKEX is reviewing its Growth Enterprise Market board and looking into the feasibility of introducing a new board. Down the road, it will launch a public consultation on the suggested proposals. We are putting considerable effort, as well, into our bond market, looking to expand our product list. Alongside the iBond, Silver Bond and other securities, we issued two US$1 billion, five-year sukuks over the past two and a half years. Guided by their success, we issued a third sukuk just about four weeks ago. Its issuance size is US$1 billion, and it will mature in 10 years. It's also worth noting that Hong Kong is the first AAA-rated government to launch a sukuk with a 10-year tenor. This extends the yield curve and sets an important benchmark for potential issuers - both in Hong Kong and around the world. Not less important, it showcases Hong Kong's ability to service Islamic finance. We are committed, as well, to the offshore Renminbi bond market. Its continuing development will enhance our bond market, while boosting our offshore Renminbi business. Hong Kong's first Renminbi bond was issued 10 years ago. Today, the cumulative amount of offshore Renminbi bonds issued here has reached RMB735 billion. Issuers range from the Central People's Government to a wide variety of financial institutions and corporations from the Mainland and around the world. More good news on the development of Hong Kong's bond market: the announcement by Premier Li Keqiang two weeks ago about the Bond Connect is a testimony of our continued effort in this respect. Asset management is another fast-growing segment of our financial sector. And for good reason. Economic liberalisation, deepening capital markets and rapid economic growth in Asia have led to accelerated wealth accumulation, and to greater demand for asset and wealth management services in the region. Corporations licensed for asset management here enjoyed a year-on-year growth of about 15 per cent. Our combined fund-management business weighs in at some HK$17 trillion. Hardly pocket money. And, rest assured, we are working to strengthen Hong Kong's position as a premier asset management centre. One key initiative is last year's legislative framework for open-ended fund companies. The new fund vehicle will attract more funds to Hong Kong, expanding industry offerings while helping build Hong Kong's fund creation capabilities. We expect the initiative to be up and running next year. Let me add that in my Budget, I announced that all open-ended fund company forms - onshore or offshore, publicly or privately offered - would enjoy a profits-tax exemption. The mutual recognition of funds also offers considerable benefits. Since the 2015 implementation of a mutual recognition of funds arrangement with the Mainland authorities, 54 funds have been authorised. These are now being offered directly to retail investors in the two markets. Aggregate net sales to date amount to some RMB8 billion. Hong Kong's attractiveness as a fund domicile received another boost in December, when we entered into a similar arrangement with Switzerland. I mentioned, earlier, the value of our Renminbi bond business. Hong Kong's Renminbi involvement, of course, goes well beyond bonds. Indeed, we are now the world's largest offshore Renminbi business hub. Our offshore Renminbi liquidity pool counts some RMB600 billion. In 2016, banks in Hong Kong handled over RMB4.5 trillion in trade settlement, a more than tenfold increase in just the past six years. Indeed, this volume accounts for about 75 per cent of all the offshore Renminbi settlements in the world. The Belt and Road Initiative will offer additional opportunities to expand our cross-border Renminbi fund flow - and a great deal more beyond that, to be sure. Indeed, Hong Kong is well placed, well equipped, to help promote closer economic co-operation and connectivity among the more than 60 countries that have embraced a Belt-Road future. Infrastructure financing, asset management and risk management are just a few areas that Hong Kong can put its financial know-how to good use. To take full advantage of the opportunities, the Hong Kong Monetary Authority (HKMA) last year set up the Infrastructure Financing Facilitation Office. Its goal is to spur the investment and financing of Belt-Road infrastructure projects by bringing together key stakeholders. To date, more than 60 Mainland, Hong Kong and international organisations, including multilateral financing agencies, development banks, investors, asset managers and professional services firms, have joined the Office as partners. Last week, the AIIB (Asian Infrastructure Investment Bank) approved Hong Kong's application as a non-sovereign member. We are going to obtain LegCo's funding approval for capital subscription as soon as possible and expect to complete the formalities by the middle of this year. We expect, as well, that our financial and professional services sector will provide valued support to the Bank's operations and will benefit immensely from such involvement. And then there's Fintech. According to Accenture, global investment in Fintech ventures grew 10 per cent, to US$23 billion, in 2016. And the good news, certainly from my perspective, is that the Mainland and Hong Kong together accounted for almost half of that total, surpassing North America for the first time. Hong Kong, blessed with a sophisticated information and communications infrastructure to support its deep pool of financial talent, can become the prime springboard for global Fintech companies looking to enter the Mainland market. No less important, Hong Kong can connect Mainland Fintechs eager to "go global". We are working to fast-track the development of Fintech in financial service providers of all sizes. Banks can now use the Hong Kong Monetary Authority's Fintech Supervisory Sandbox to test their Fintech initiatives, doing so without having to fully comply with the usual supervisory requirements. And some 50 Fintech start-ups are receiving comprehensive support under Cyberport's dedicated Fintech incubation programme, launched also last year. Our target is to help 150 Fintech start-ups scale up their business by 2020. Our ambition is somewhat loftier: we would like to help raise a prized unicorn, or three, from the herd. The Government is determined to promote Hong Kong as a hub for the application and setting up of standards for Fintech. That includes distributed ledger technology. The HKMA and the Hong Kong Applied Science and Technology Research Institute are exploring, with a number of banks, the feasibility of applying distributed ledger technology. Last year, they published a White Paper on this. They will continue to examine the technology in the coming year, keen to make it happen for Hong Kong. While I can't predict the future, and while Hong Kong can't simply will it, we can plan for it. What's more, we can help enable those plans. In that regard, it certainly helps that Hong Kong is blessed with a "one country, two systems" framework. That our economic fundamentals are robust, our financial system resilient and our professional services sector multicultural and multi-talented. Ladies and gentlemen, I wish you a rewarding Asian Investment Conference and the best of business in 2017. I also invite you to join us, here in Hong Kong, as we also recognise a 20th anniversary. In our case, 2017 marks Hong Kong's 20th year as a Special Administrative Region of China. I would say that we both have plenty to celebrate. This year - and for many more years to come. Thank you for having me this afternoon.